It’s that time of year again: the municipal election. Candidates will soon be slogging through forums and questionnaires, doorsteps will be littered with fliers and advertising, ballots will be arriving in the mail, and voters will be trying to sort through mountains of information on the candidates and issues. The Blue Line is here to make it a little bit easier for everyone. 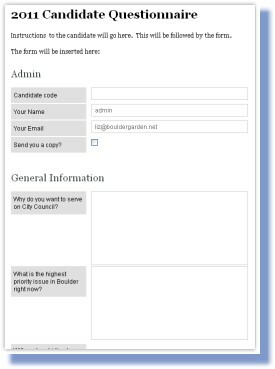 Our upcoming Election 2013 section will have a number of features for voters and candidates. Take a look at what we have to offer and check back often for updates. This election will be conducted strictly via mail-in ballot. Is your registration up-to-date? Will your ballot be sent to the correct address? Thanks to the good people at New Era Colorado, you may register to vote or update your registration via a link on the Blue Line. During the 2011 municipal election, instead of receiving questionnaires from dozens of separate organizations, City Council candidates were able to focus their time and attention on the Blue Line’s Community Questionnaire, a compilation of questions from those same organizations. And, instead of having their answers posted at dozens of separate places, if they were posted at all, they were posted here, online, for everyone to read. If your organization is not listed here, and you were planning on sending a questionnaire to the candidates, consider sending it to the Blue Line instead. We will incorporate it into the Community Questionnaire. The deadline for submissions is coming up quickly. All questions for candidates must be submitted to the Blue Line by the end of the day on Monday, August 26. Voters and organizations preparing endorsements will be able to read and compare candidates’ responses to the Community Questionnaire via the Blue Line. Instead of scanning through pages and pages of multiple pdfs, you will be able to select a topic of your choice and find out where a particular candidate, or all the candidates, stand on that topic. 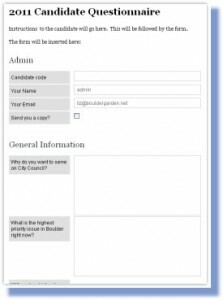 Look for candidate responses to be posted here in mid-September. Watch the Blue Line for exclusive interviews and articles with City Council candidates. Tentative arrangements have been made for students in Instructor Jeff Browne’s upper level CU News Corps course at CU-Boulder to interview the candidates and produce profiles for the Blue Line. Look for articles from these budding journalists. The Blue Line is very lucky to have scientist, writer, analyst, photographer and all-around engaged citizen Zane Selvans volunteer to cover the three PLAN-Boulder County candidate forums for the Blue Line. His excellent coverage of the 2011 forums and debates was very much appreciated. The Blue Line has topped 56,000 unique visitors, with over 800 articles posted by about 150 authors. We’re pretty proud of how far we’ve come as an all-volunteer, non-profit organization. We try to offer fresh, relevant content as often as possible, and we’re very excited about the election coverage we’ll be providing. We could do even more with your support. How can you help? Share your expertise – the feedback we receive is that our readers enjoy articles that help them understand issues that are otherwise not covered in sufficient depth in other media. If you have a particular area of expertise and can offer information or perspectives that fill a gap, please send it to the Blue Line. Be a reporter – we have a couple of folks who attend public meetings and write them up for the Blue Line. This is a huge community service and very welcome content. Please consider taking notes and writing up the next public meeting you attend. Issue your Call to Action – community members often have a particular issue that is coming up before City Council, the County Commissioners or other agency and they want to raise awareness and turn out speakers. Write it up and send it in! No astroturf, please. Announce your cultural or neighborhood event – write it up and send it in. We’ll publish it under your byline. Comment on articles – if you read something that you want to respond to, please comment. Our authors want to know that you’ve read their pieces and what you think of them. We ask that you log in first in an effort to prevent anonymous Internet trolls. Give feedback – we love feedback! Please contact us whenever you are inclined. If you have feedback for an author, we’re happy to forward it to the author for you. Rate articles – if you read an article that you like (or don’t like!) and want to remain anonymous, rate it using the star system at the end of the article. Share articles – if you’re on Facebook, share Blue Line articles with your friends by clicking the Facebook icon at the end of the piece. Become a fan – the Blue Line has a Facebook page. Like it! Subscribe to our mailing list – get the latest original content in your email, once per day. Sign up here. Donate – we operate on the tiniest of budgets, using volunteer labor, open-source software, free email services, and royalty-free images as much as possible. But we still pay for webhosting services, stock images when free ones aren’t available, and occasional small gifts to Blue Line community authors. Make a donation. Every little bit helps.